iPhone and iPad users are so loyal to Apple and unlikely to switch to another platform that one analyst has pegged their total collective value at nearly $295 billion. Bill Shope with Goldman Sachs said in a note to investors on Friday that he believes the average single iOS customer is worth $1,053. That assumes the average selling price of an iOS device for the June quarter is $535 with 5 percent erosion, gross margin is 45 percent, and annual defections are 5 percent. "This implies a cumulative iOS customer value of nearly $295 billion on today's installed base, without any consideration for the content, services or peripherals streams, or for the platform's growth potential," Shope wrote. At a value of $295 billion, iOS customers represent about 55 percent of Apple's current market cap. That's before including the company's $110 billion cash balance, an iOS install base that continues to grow at a tremendous pace, or the value of the company's Mac and iPod businesses. Goldman Sachs recently conducted a consumer survey of over 1,000 respondents, in an effort to better understand the costs that customers face when they switch platforms. 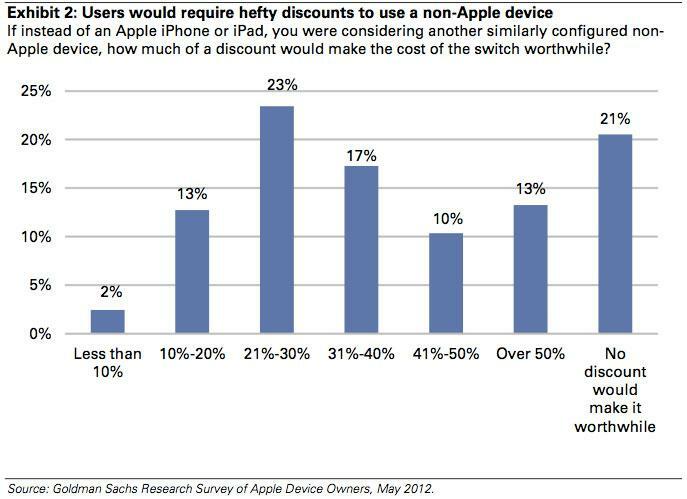 The survey found that 21 percent of respondents said no discount, regardless of the amount, would make it worthwhile to leave Apple's platform. Among those who said they would consider switching, more than half of those said they would need a discount greater than 30 percent. Among those polled, 71 percent said they are "highly likely" to choose an Apple device for their next tablet or smartphone purchase. Another 23 percent are "likely" to stick with Apple's ecosystem, while only 1 percent were "unlikely" to stick with Apple. Switching costs for customers only grow when they own more than one device in the Apple ecosystem, and the new iCloud service adds yet another layer to the switching costs, Shope said. Among those polled by Goldman Sachs, 30 percent said they are paying for extra storage capacity or iTunes Match with iCloud. "Considering that apple has disclosed that it has 120 million iCloud users as of its earnings release on April 24, this is quickly becoming yet another high-margin revenue stream for the company," Shope said. "More important, however, this also suggests that a large portion of Apple's installed base is adding yet another source of explicit switching costs." In all, he estimates that the switching cost per iOS user ranges between $122 and $301. 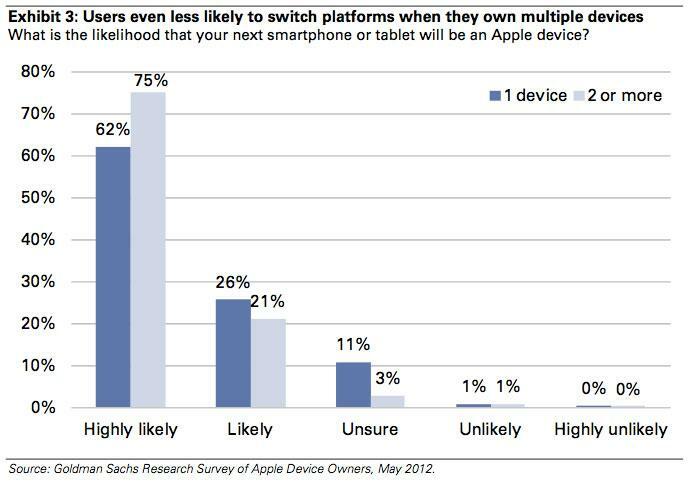 That implies the average user would need a discount of 49 percent to switch to a competing platform.